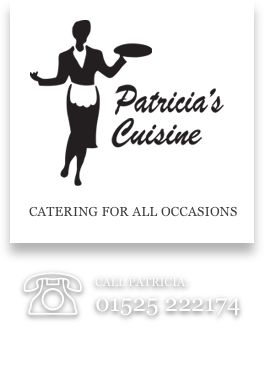 Patricia's Cuisine is a quality caterer based in Bedfordshire with a long-held belief that, wherever possible, it's always better to cook with locally produced, superior quality food. Follow our caterer, Patricia Harris, from daybreak to early evening - a series of snapshopts through a typical day in the life of a caterer as Patricia travels through Bedfordshire, Buckinghamshire & Hertfordshire to visit her local suppliers. For a caterer, working days tend to start early and this day was no exception. After a nice cup of tea to start the day, first on the agenda was a drive from our kitchens in Eaton Bray, Bedfordshire to Bletchley in Buckinghamshire to visit our baker and collect an order. Our first visit of the day was to our supplier of bread, rolls and other baked delights, Turneys Bakery in Buckinghamshire. When we arrived at the bakery Rex had already finished the first shift of the day and Paul was beginning the baking of our order of loaves. Rex is a little camera shy so Paul was more than happy to show off his traditional bakery skills. Turneys bake by hand everything by hand, quite literally, there is no production line churning out baked goods on a mammoth scale; their ingredients are weighed and added by hand - the bakers' feel was immediately self-evident. A local independent bakery, Turneys has been suplying us with freshly baked loaves, rolls, baps for a number of years now and we know the quality Rex and his team maintain is recognised by our customers based on the regular complimentary feedback we continue to receive. Turneys bake to order so know that the bread we cater with is as fresh and as tasty as we can possibly make it. You can be assured that the freshly baked bread we use for our sandwiches and served buffets hasn't been sitting around on a wholesale warehouse shelf for days! A phone call on the way back from the bakers meant Patricia needed to go back to her catering kitchen based in Eaton Bray, Bedfordshire to sort a problem out but at least it offered an opportunity to grab a quick cup of tea. 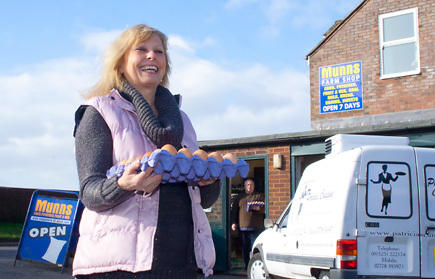 Patricia's Cuisine will always use fresh eggs when cooking and we source our fresh eggs locally from Alan Mead, owner of Munns Farm Shop in Dagnall, Hertfordshire. When Patrica first set up in business, long before she established the catering business Patricia's Cuisine, she built-up a highly successful egg round by taking fresh eggs from her Eaton Bray farm to bakeries and shops across Bedfordshire, Hertfordshire and Buckinghamshire. Patricia, therefore, completely understands the importance of getting the very freshest eggs to cook with. When it comes to cooking with vegetables, you simply can't beat the taste and nutritional value of seasonal vegetables which have just been pulled from the ground. 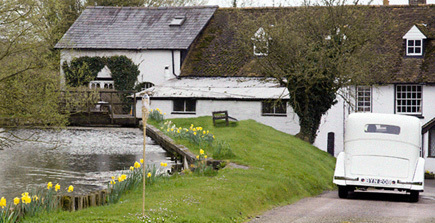 We source all our in-season vegetables from Common Farm, Eaton Bray, Bedfordshire. Our next stop was to pay a visit to Frank and collect a sack of his potatoes. A quick change and then on to Patricia's next appointment to meet a customer and explore menu options for a forthcoming birthday party. 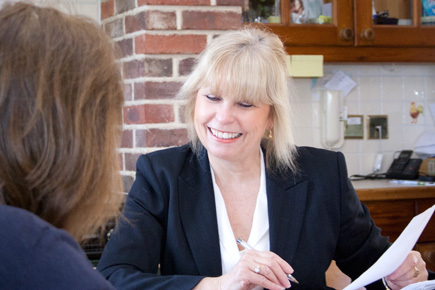 Patricia doesn't expect clients to know their way around a menu so is always available to discuss food choices and quantities. Catering choices are made easier thanks to a very extensive range of menus for all occasions, tastes and ages yet there's still no substitute for talking about the catering arrangements. When a set menu isn't quite right Patricia can advise customers on the creation of a bespoke menu, specifically created for the occasion. We didn't have far to travel for one of the last visits of the day. We source our meat from our local butcher, Hines Butchers which is just over the road from our catering kitchen in the High Street of Eaton Bray, Bedfordshire. Hines' Head Butcher, Neil, who Patricia has known for many years, proudly makes the famous Derek Bunker sausages by hand to a secret family recipie. Besides their reputation for their famous sausages D & E Hines are known for their own cooked meats and ham. The butchers' shop has been in the same family for years and Patricia loves to choose the best cuts of meat and talk to Neil about preparing it. The last visit of the day was to the wholesellers' to buy a few catering essentials. We're proud to be a caterer that, wherever possible, buys quality, locally sourced ingredients from food producers across Bedfordshire, Hertfordshire and Buckinghamshire, in order to serve you with the freshest and best tasting food we possibly can. 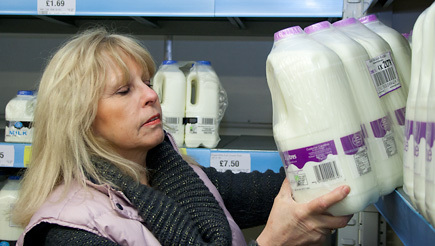 There are, however, some things that simply aren't available on our doorstep so for bulk catering packs of milk, cooking oils, tea, coffee, flour, sugar Patricia scours the aisles of the local catering wholesale for the best deals. Quality Catering For Any Occasion. We offer banquet style catering, family service or silver service for weddings, birthday parties, corporate events, funerals, business lunches and BBQs.